Each Spring and Fall we anticipate the coming harvest of wildflower honey. Honey Bees make sweet wildflower honey from the fragrant nectar of trees, bushes, flowers and herbs near their hive. The taste and composition of our wildflower honey can vary dependent upon the variety of flowers in bloom at the time the honey is made. Heritage Bee Farm’s local wildflower honey is gathered from our wildflower sources such as: Holly, Galberry, Palmetto, Spotted Mint, Golden Rod, Spanish Needle and Brazilian Pepper. The type of flowers the nectar originates from influences the color and flavor of the resulting honey. As the honey bees utilize the assortment of flowers found in nature, the honey is simply referred to as wildflower honey. The taste, aroma and flavor will vary from season to season, depending on which flowers are dominant at the time the nectar is collected. 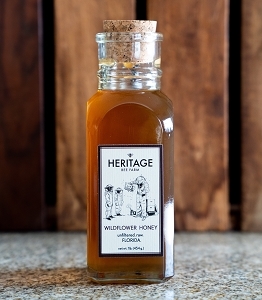 The mild floral flavor and sweetness of Florida’s wildflower honey makes it a popular sweetener for hot or cold tea. You can also use it to sweeten other beverages, such as coffee, as well. Try drizzling wildflower honey on top of pancakes and waffles or use it on muffins and biscuits instead of jam. However you decide to use our premium wildflower honey you can be sure it is 100% raw, unheated, unpasteurized, unfiltered, unprocessed and in the same condition as it was in the hive. 4oz. Muth Jar 100% Raw Natural Honey. Customizable Labels, Vintage Honey Bottle perfect for weddings and parties or any tea lover! Honey Bees collect nectar, which contains carbohydrates, from flowers and take it back to their hive. The nectar is partially digested into more simple sugars and stored in the honeycomb inside the hive. Eventually it loses moisture and condenses into thick, sweet honey and It's a rich source of calories and carbohydrates to provide you with a quick energy boost. The potential health benefits of honey are numerous due to its nutrient rich content and anti-microbial properties. Antioxidants are powerful immune-boosting compounds found in raw honey. These compounds protect your body from oxidation; a degenerative process that can leave cells harmed and aged beyond their time, according to the University of California-Davis news website. UC-Davis researchers held a study to determine the potential medical advantages of honey. The researchers enrolled 25 individuals to take 4 tablespoons of honey daily for 29 consecutive days, according to the Medical News Today article, "Honey May Have Sweet Health Benefits." The results of this review showed a significant increase of antioxidants in the participants’ blood streams. Researchers concluded that the consumption of honey may offer health advantages by providing antioxidants, compounds linked to increased immune function and protection against conditions like heart disease and cancer, according to the UC-Davis website. Honey is used mainly as a sweetener. It's comprised of two types of sugars, or simple carbohydrates, which are fructose and glucose. 1 tablespoon of wildflower honey, results in 64 calories and 17 grams of sugar. This dense source of calories and sugar provides you with a quick-digesting source of energy. You may also get traces of amino acids, enzymes, minerals and vitamins from honey. Many feel that honey produced from the nectar of local wildflowers can relieve you of seasonal allergies. Local honey is frequently eaten by allergy sufferers with the belief that it supports and boosts the immune system and acts much like an immunization by building up your body’s antibodies to allergens and pollen. Eating wildflower honey from the area local to you may help to decrease the symptoms of seasonal allergies caused by the pollen in your region. Local wildflower honey should be harvested in the area your allergy symptoms typically flare up. Such honey contains the pollen that causes the increase of histamine which leads to allergy symptoms. Most flowers and plants pollinate at specific times of the year, which is why many have allergy symptoms only during 1 or 2 seasons every year. Randomized controlled studies, for example the Honey Study, shows that local, raw honey provides relief of seasonal environmental allergy symptoms comparable to antihistamines. Many of our customers have expressed the noticeable benefit of eating our wildflower honey not to mention the many great reviews of its taste. Order your Premium Wildflower Honey Today!